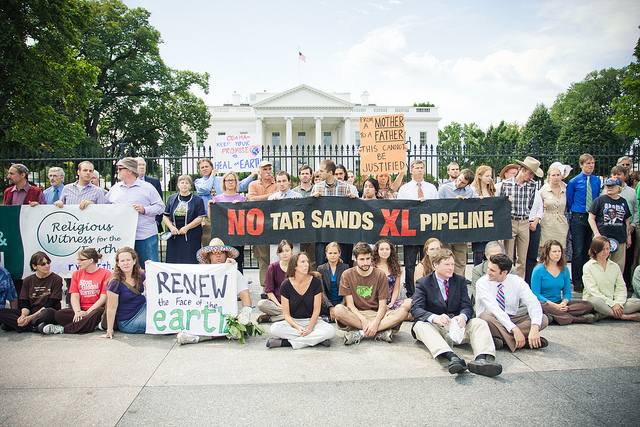 More than 140 people took part in the Tar Sands Action sit-in this morning outside the White House, including a delegation of 60 religious leaders, NASA’s Dr. James Hansen, CREDO Mobile president Michael Kieschnick, Greenpeace Director Phil Radford, 350.org Executive Director May Boeve, and many others. Nine people were arrested in Moscow, Idaho over the weekend as they protested the movement of a so-called megaload of oil field equipment bound for an Imperial Oil/ExxonMobil oil sands project in Canada. Hundreds of Spaniards demonstrated Sunday against a constitutional reform plan aimed at capping budget deficit. Around 2,000 people in Bahrain have demonstrated to call for an investigation into an alleged plot to rig upcoming elections. Hundreds of protesters demonstrated Sunday against the Mexican government in the aftermath of a casino arson attack that killed 52 people and has been labeled one of the worst crimes of Mexico’s deadly five-year drug war. More than 5,000 Ukrainian opposition demonstrators, many of them clad in traditional white embroidered shirts, protested the arrest of former Prime Minister Yulia V. Tymoshenko on Wednesday, clouding official celebrations of the 20th anniversary of Ukraine’s independence declaration. Thousands protested massive layoffs by a major construction firm in central Seoul over the weekend, before they were broken up by police using water cannons for the first time in three years. A small town in central Italy is trying to go independent and mint its own money in protest at government austerity cuts. Re the Tar Sands arrests: It’s very gallant of those who can afford the time and plane fare (which uses oil-derived fuel) to get arrested in D.C., but it is futile, because it will not have the slightest affect on Obama who, get it through your heads, is a tool of the ruling class. The rhetorical question which NOBODY seems to have asked: does not Canada have oil refineries? Shipping ports? So why a 1700 mile pipeline to Texas?? The answer, obviously, is because USA oil companies want to reap more money. In environmental struggles, the one group of people hardly EVER paid attention to is the WORKERS. And this is a tough one, as the siren song is always JOBS. Yet, ultimately, THEY are the power: if they don’t do the work, it doesn’t get done. How do we even BEGIN to tackle this? ?